Sussman Shank LLP is pleased to welcome Drew Eyman as an associate to the firm's Litigation Department. The Health Care and Business legal team at Sussman Shank LLP recently represented the sellers in the sale of Courtyard at Mt. Tabor. Sussman Shank LLP is pleased to welcome three new members to the firm's Litigation Department. Timothy J. Coleman joins the firm as a Partner, Tab Wood joins as an Associate, and Sean R. McClendon joins as a Staff Attorney and Paralegal. 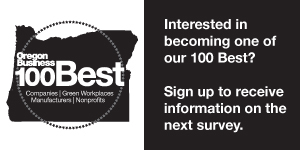 Sussman Shank LLP Named One Of The 2018 "100 Best Green Workplaces in Oregon"
Sussman Shank LLP is proud to announce that our firm has been named one of the 2018 "100 Best Green Workplaces in Oregon" by Oregon Business Magazine. This marks our seventh year on the list. Our employees place a high value on sustainable practices, implementing a variety of green policies at our firm which have led to our consistent ranking. Sussman Shank LLP is pleased to welcome three new members to the firm’s Litigation Department. Derek J. Ashton joins the firm as a Partner, Kimberlee Petrie Volm joins as an Associate, and Kristin Eisenhauer joins as a Paralegal. “We are thrilled to welcome the newest members of our team. These additions will add increased capacity, practice diversity, and trial experience to further strengthen the breadth and depth of our already strong Litigation Department,” said Steve Seguin, Chief Operating Officer of Sussman Shank.